The question is often asked about how could Catriona have NOT seen Maddie in creche? During the week, (the uneventful part of the week) IS IT POSSIBLE that Catriona was only looking after Ella? 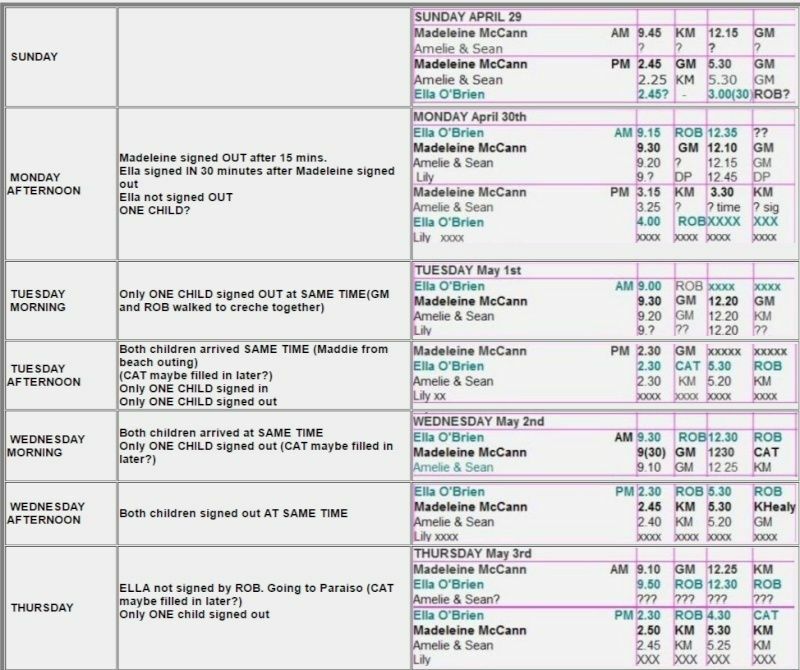 IS IT POSSIBLE that Catriona was TOLD that she had been looking after Maddie that week after the abduction? IS IT POSSIBLE that she second guessed herself? IS IT POSSIBLE she thought to herself 'Oh...I must have been calling that little girl Ella all week when it was Maddie'? IS IT POSSIBLE she didn't recall seeing Maddie but was INTIMIDATED to believe she had and didn't want to challenge? 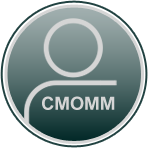 IS IT POSSIBLE that GM or KM and ROB arrived at the same time but only one signed the register? IS IT POSSIBLE that the register was not always within view of the nannies? IS IT POSSIBLE the children were dropped off randomly without the register available? We know that the Kids Club creche was shared by BOTH groups Lobsters AND Sharks as well as the babies. IF something happened to Madeleine earlier in the week, IS IT POSSIBLE that it was unnoticed but after being TOLD she was there, everyones memories 'forced' them to remember her? Title: Madeleine and Ella - Is it possible that ONLY ONE CHILD was attending creche? Re: Madeleine and Ella - Is it possible that ONLY ONE CHILD was attending creche? I thought Cat Baker had been to Rothley and was a friend of Jon Corner's daughter? Is it likely she wouldn't know who Madeleine was? @HiDeHo wrote: Before replying, can I start with what may be thought an irrelevant question, but just might be relevant to the topic: in which group (if any) was Lily Payne in that week? ANS. Not if you believe (a) that Cat Baker's crèche records are accurate and (b) that some at least of the sightings of Madeleine on and after Monday are true. During the week (the uneventful part of the week), IS IT POSSIBLE that Catriona was only looking after Ella? IS IT POSSIBLE she thought to herself: 'Oh...I must have been calling that little girl Ella all week when it was Maddie'? ANS. Absolutely not. No way would Ella be called 'Maddie' for any part of that week in the creche. ANS. NO. Let us assume (as I do) that she and the McCanns and Madeleine were either in introduced to each other on the Saturday 'welcome meeting' or on the Sunday morning 'meet the nannies' session (or may be both). Then there is absolutely no way that Cat Baker would not know who Madeleine was. 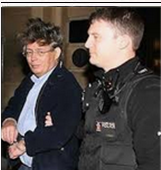 Further, 'Google.Gaspar.Statements' makes a valid point, viz...Chloe Corner and Cat Baker being FB Friends in 2006...Jon Corner's 'frequent' visits to Praia da Luz...Cat Baker staying in Rothley with the McCanns in November 2007 (around the time of the secret Rothley Court 'meet-up')...all of this suggests that the McCanns and Cat Baker may have known each other before April 2007. ANS. She would 100% know whether Madeleine was in the crèche from Monday onwards - or not. IF something happened to Madeleine earlier in the week, IS IT POSSIBLE that it was unnoticed but after being TOLD she was there, everyone's memories 'forced' them to remember her? ANS. NO. If any child was missing from Monday onwards, of course the creche nanny would notice the absence. Whether, if Madeleine did go missing earlier than Thursday 10pm, anyone on the Ocean Club staff was required to lie or fabricate stories is a question often raised, but it would be doubtful if very many could be persuaded to do so. If Madeleine (or any other child for that matter) was absent from the crèche from Monday onwards, it only would need that crèche nanny to co-operate with that child's parents and then (a) arrange the creche records so that it looked like the child was there, and (b) then lie to the police about whether she was present on those days or not. There were likely a lot of children there that day. Would Catriona have met Maddie AND remembered visually which child she was during the week ? Jon Corner's 'frequent' visits to Praia da Luz... - Again, is it possible to post the proof, though I'm not sure where it is relevant to post. 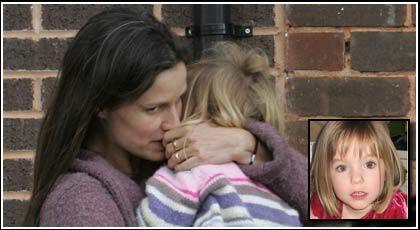 Cat Baker staying in Rothley with the McCanns in November 2007 (around the time of the secret Rothley Court 'meet-up')... Yes, that was after all this happened so not sure on relevance. 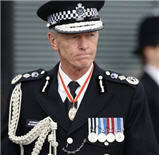 all of this suggests that the McCanns and Cat Baker may have known each other before April 2007. I would have to see some kind of proof before I could comment on that. The creche records were not like a school register to check children were there and have them all arrive at similar times. It seemed to be less about which children were there and more about where the parents could be located if needed. More of a formality maybe? @ HideHo Thank you for the replies. I will try to answer your queries later, I did find proof of Chloe Corner and Cat Baker having been FB friends before 2007; however I have not been able to find the original source for the Jon Corner quote - it was his own words, something like 'I've been to Praia da Luz many times'. Could you please answer my question about Lily Payne. I would like to know which creche group she was placed in that week. I wrote: ANS. She would 100% know whether Madeleine was in the crèche from Monday onwards - or not. "Hi, I'm Gerry McCann. This is Madeleine. She usually answers to Maddie". "Oh Hi Maddie, we have some lovely things for you to do today. Mr McCann, have you put your contact number on the crèche sheet?" "Yes. Do we collect her at 12.30?" "Yes, we're doing a few indoor things this morning so see you then". "Bye bye Maddie, be a good girl". "Come along Maddie, do you like drawing? We've got some paint brushes here and some big sheets of paper. What shall we draw?" "OK Maddie, draw me a nice house..."
"How was Maddie this morning?" "Oh, just fine, she settled really well. Tell your Mummy what you've been doing, Maddie"
"Painting. I made this picture". "Ooh what a beautiful house you've drawn there Maddie! See you in the afternoon, Cat, we'll be back about 2.30". IMO there is no possibility whatsoever of mistaken identity. Not that it matters if I'm correct, but there's no way you can possibly confuse 'Ella' with 'Maddie' or 'Madeleine'. Meeting a lot of children on Saturday/Sunday..
All children from Sharks and Lobsters (maybe 14 or so) are running round the creche. Then 'Maddie was abducted' and Catriona came to the realisation that SHE was in charge of Maddie during the week, but didnt recall. She feared for her responsibilities in her job and would not have said 'I don't recall if/when Maddie was here'... and instead thought that Maybe (judging from the photos) that the girl she had been calling Ella all week may have actually been Maddie. I am not saying that DID happen but if she was not familiar or hadnt read the sign in sheets prior to the abduction then the real Maddie may not have been missed if she was only there for the first day or so. I agree HiDeHo regarding recognition of a child. We recognize our children from a distance even, because we know them, know their clothes,know the sound of their voices.We are imprinted with them. We have lived in this house for 16 months now and there are two children who live in the house across. I know what they look like sound like but if you were to ask me to describe how they look and sound all I could say is the little boy is very loud and the little girl has the most amazing corkscrew hair and I have seen them, ok from a distance, for all this time. I am imprinted but only with sound and very unusual hair. It was the start of the season and so getting to know children was easier as the nannies were not bogged down with months worth of memories of creche children. I would be interested to know their memories/recollections of all the other children there that week,but of course we never will. 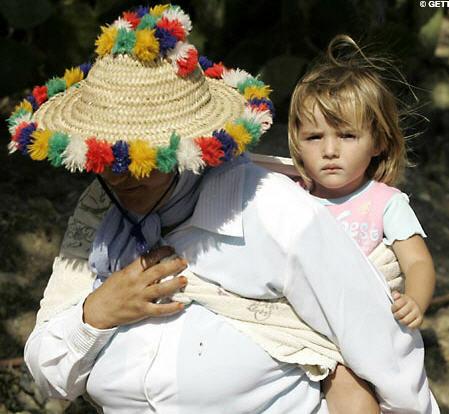 Just for reference purposes, here is Jane Tanner carrying a child who is purportedly Ella. Interesting that she's wearing a jacket that's similar to the one Amelie was often photographed wearing (Irish photos). And that she's hiding Ella's face from the camera. I really have no idea what the situation was at the creche whether the suggested scenario could be correct or not, or whether thee is another explanation, but it leaves me with what I see in the files ...a coincidence that I feel may explain a lot... and it also explains after the files 'tell me' that Maddie wasn't around in the week, how it was accomplished. You could be right Tony . How do you feel Maddie was booked into the creche if she wasn't around during the week? I'm hoping that Catriona isnt suggested as being part of all this though. My belief is that she was in the wrong place at the wrong time and I see nothing to suggest she was part of anything. Just looking at those photos of a child being protected from publicity by Jane Tanner are really thought provoking. How hard it must be for her . 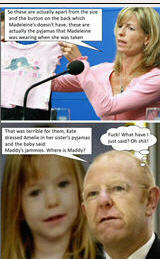 Another possibility is that Maddie was never at the creche in the first place. The nannies would believe what they were told by the parents since they would not know any different. It is also a possibility she was introduced to the staff on the first day and was never there after that. With so many children and only a brief introduction where they are told child X is child Y who can prove different? When the abduction charade is initiated, the creche workers will have known the child is likely to have been deposited into their care, it isn't however a certainty. We have parents signing in late signing out early, even signing out after a few minutes. is it possible that a switch took place, that child X was signed in as child Y and them within minutes signed out again. The records would indicate that child Y was signed into the creche and almost immediately signed out. Someone would have a good reason to sign a child out after 15 mins if the child wasn't who they claimed it was and they didn't want one of the creche workers to ask where Child Y is when they have Child X in front of them? It would prevent awkward questions as to why someone was signed into the creche who wasn't actually who it was claimed they were. 15 mins shows a child was signed in and signed out again. Who is going to remember if a particular child was signed in and signed out again 15 mins later whilst they were getting everyone settled and organising who was playing with what. They will at best remember a vague female child amongst many female children. Were they familiar enough with Maddie to be 100% certain she had actually been signed in? Had the evening creche been used or the mccanns had hired a babysitter, then the creche staff would probably have had a firmer memory of Maddie, seeing her in the creche during the day and then in the evening in the creche or in the apartment. As it is, she was simply one among many, all wanting attention, running around and doing what toddlers do. But WHY sign a child in and then out again 15 minutes later? I added this report just to get a sense of what creches can be like, especially at the beginning of the season, and as in the video (which was at Buttons) two nannies with 13 children and didn't appear to be overly organised. Just to maybe highlight that OC creche register shows one child in and one child out...so COULD it have been possible it was just the one child? Mark Warner operates at the top of the holiday market, charging up to £8,000 for two weeks abroad for a family of four. It makes a point of offering "award-winning" childcare. That award-winning care didn't extend to checking my CV, contacting my references, doing a criminal records check or even asking to see some basic ID. Again, I could have been anyone. I worked at Mark Warner's swanky Hilton resort in Dahab, Egypt, where the luxurious hotel rooms are built to resemble a traditional whitewashed Arab village. Despite being promised two days' training at the interview, I was thrown straight in with a group of toddlers. Once, there were two of us looking after 13 children - when Mark Warner's own regulations state there should be no more than six per adult. When I asked about my training, the manager just said: "You don't get official training as such. It's very relaxed, very laid-back here." This is unlikely to be the approach parents think they are paying for. Next, I was asked to supervise the children on the beach. Again, no one had checked if I had any swimming or rescue qualifications. Even more worrying, I had to take children out on a boat without enough safety gear for all of them. When I raised the issue with my manager, he told me to go ahead with the boat trip anyway. Also, for such a prestigious company with an upmarket reputation, Mark Warner has a very cavalier attitude to the employment laws of the countries where it operates, and is not controlled by Ofsted. Like many of its staff in Dahab, I was there on a tourist visa. Mark Warner should have paid for work permits but instead had us break Egyptian law on their behalf. We were told we should just lie and say we were there on holiday, but Egypt is not the kind of country-where you want to end up in prison. Three weeks after I returned from Egypt, the disappearance of Madeleine McCann from a Mark Warner resort in Praia da Luz in Portugal made headlines around the world. No one blamed the company or its staff for the little girl's disappearance, but given the case, I assumed the company would toughen up its vetting of nannies. To test this out, a BBC colleague applied for a Mark Warner childcare job and was sent to an upmarket French ski resort. Her false CV went unchecked and, months after the disappearance of Madeleine McCann, the company still didn't do a CRB check before she started work. Later, I recounted my experiences to Mark Warner's managing director. He refused to be interviewed but issued a statement that said: "It is company policy that all childcare staff employed by Mark Warner must supply two references and submit a form to check their criminal record. @worriedmum wrote: But WHY sign a child in and then out again 15 minutes later? To have a written record that child X was alive on that day and that time even if she wasn't and a substitute had been signed in under her name. More so if they suspected or learned that someone who was more familiar with Maddie would be coming into the creche to help with the group Maddie was allegedly in. They would not want someone who knew Maddie coming in and, on not seeing Maddie, asking where she was as her siblings were in the creche in another group. There would be awkward questions if a nursery worker said "This is Maddie" and pointing out a different child. 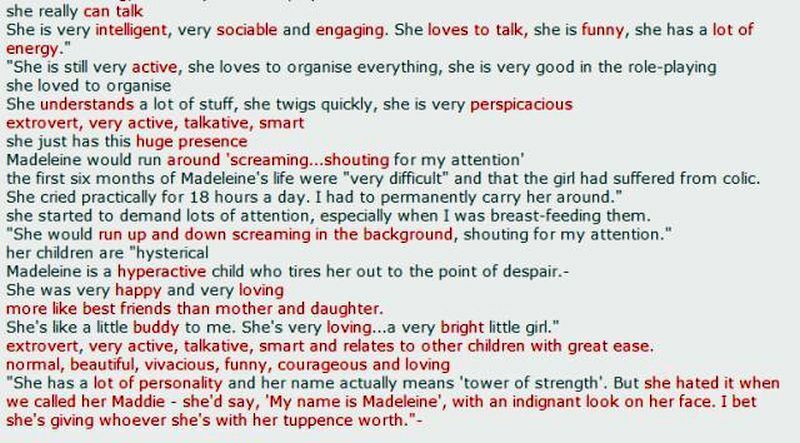 The first question asked would be what is her surname, especially if there was a Madeleine or Maddie x 2. 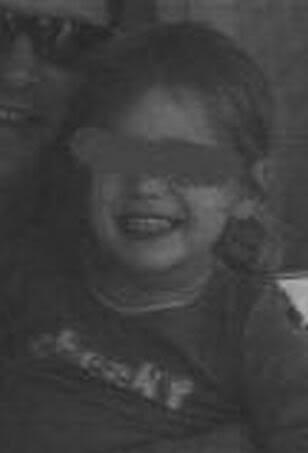 If the response is mccann, then natural instinct would be to say, that's not Maddie mccann. Checks would be made asking the child who she was and then checking the sign in sheets to see who was signed in and present, who had been signed out and who had doing the signings in and out. If it turned out that kate and/or gerry had signed in the child allegedly called Maddie, and it wasn't Maddie, questions would be asked as to why they signed someone in who wasn't who they claimed it to be. Questions would be asked as to where Maddie was, especially if they see kate and gerry playing tennis, jogging or lounging around and no Maddie with them. After all the mccanns had signed their children up for the creche all day. Would Maddie have been left home alone? If so why were her parents , or at least one of them, not at home with her? They would be asked to produce Maddie. If Maddie was dead and they couldn't or wouldn't produce her, then the police would likely have been called as there was a child missing, especially if they thought the child was/ should have been in the creche. MW would be panicking that they may have lost a child in their care and a massive lawsuit would be forthcoming. 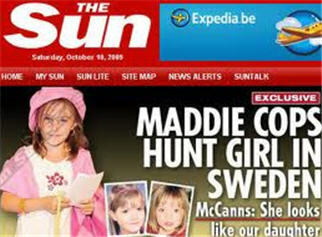 The mccanns would be panicking because they can't produce a live Maddie and would now have to think of some off the cuff excuse, probably along the lines of she is in the apartment, we'll go get her and then feigning OMG she's not there, or having a MW representative or a police officer come to the apartment with them and then feigning the OMG she's not there moment. When something is done, it is done for a reason. Why would they need to sign a child out,15 mins after they had just signed her in? @Harriet94 wrote: Just looking at those photos of a child being protected from publicity by Jane Tanner are really thought provoking. How hard it must be for her . Pity the McCanns didn't think the same about protecting other babies and children, splashing their innocent faces all over the front pages even though they knew Madeleine was dead. On Sunday April 29, there is a squiggly line separating AM and PM. On Monday, April 30, there is an empty line separating AM and PM. On Wednesday May 2, there is a squiggly line separating AM and PM. On Thursday May 3, there is a squiggly line separating AM and PM. On Tuesday May 1, there is no squiggly line separating AM and PM, and no empty line. Instead, the last child signed out in the morning is Madeleine McCann, and the first child signed in, in the afternoon, is Madeleine McCann. With no space between morning and afternoon. It might be suggested that she had been added into the blank line between morning and afternoon after the fact, to try and prove that she was there, in chronological order. Wasn't it on Tuesday night, May 1, that Mrs. Fenn heard the crying? "Daddy daddy"... or was it "Maddie Maddie"? A reminder: it was Monday, April 30, that Madeleine was removed from the creche after 15 minutes. Hobs theory above carries a lot of weight. On April 30, Madeleine was taken out of the creche at 12.10pm by Gerry. She was not returned until 3.15pm, and then taken out 15 minutes later. What went on between 12.10pm and 3.15pm? 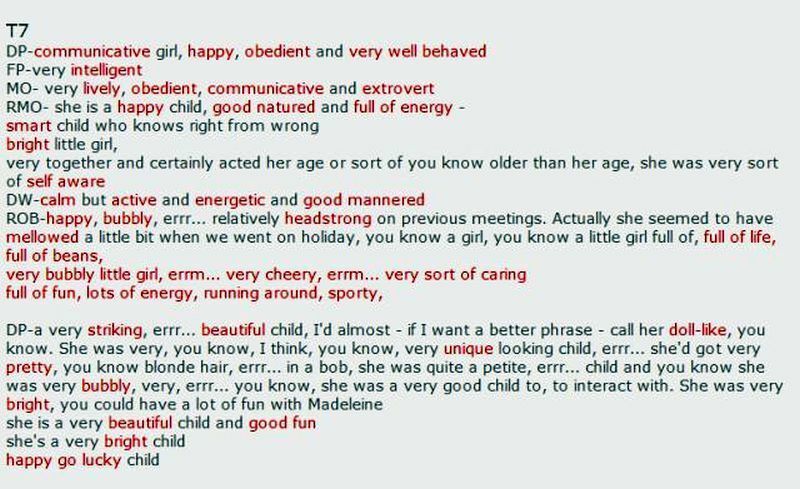 Is it possible that whatever happened to Madeleine, occurred initially on Monday April 30, either during that long period between morning and afternoon, or afterwards, when Kate took Madeleine out of the creche after 15 minutes? If it happened during the noon break, perhaps it was something catastrophic, and Madeleine's entry of only 15 minutes was just what Hobs describes, an attempt to prove she was there and alive. Or did something more sinister happen, after the 15 minutes? 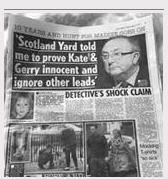 Could Kate have been angry about something or someone, and could she have removed Madeleine from the creche in an act of anger? Why then, the lack of a blank line on the creche record on Tuesday, May 1? Possibly Madeleine was signed in, in the morning, and not there. Possibly it was planned that someone sign Madeleine in, in the afternoon, but someone forgot. And had to backtrack, and use the only line available to make it look authentic - the blank line. Why go to the bother of signing a dead Madeleine in anyway? It was a creche, it wasn't a mandatory school. No child has to go to a creche when they're on holiday. An attempt to prove she was there and alive? ETA Hobs stated further up the thread, "when something is done, it's done for a reason"
Yes, of course, sorry - should wake up and take more before I post! The hoax started way before the faked abduction. Although becoming celebrity millionaires who got away with the crime of the century was decent compensation, I suppose. I've always found - the more waffle, the greater the deception. So, IMO, it's quite feasible that there was something going on involving MBM/Ella that week. Not necessarily from the very start, although again feasible, but also possible that any deception started after a day or two but that the whole subject of Ella at the creche is a highly sensitive area for Jane. So she obviously wouldn't have missed one if she'd gone with 6 and returned with 5! You would have thought that the sailing trip on which MBM and Ella were both said to have gone, and/or the mini tennis session, would have thrown up that one of the girls was missing. However, we don't know Cat Baker well at all - she might be wonderful with children on an individual basis but c*** with groups. There's a massive difference between working with one or two children and working with groups - different skill set altogether. The more you study the creche sheets for the Lobsters, the more jumps out at you and the more contrived they appear. IMO, someone has added to them or changed them - who did this and whether it was to cover up glaring inefficiency or something way more sinister is the question. Re: the sheets, just noticed that the a.m. book in time for MBM on Sun 29th (undated sheet) seems to appear as 9.45 a.m. In GM's 10 May statement he states that MBM was dropped off at 9.50 a.m., which is an acceptable discrepancy, however, I would wager a considerable amount that the time initially registered was 9.15 a.m. The 1 has been changed to a 4, I wont hypothesize why this might be. Nowhere else do KM or GM write a french 4 (both took MBM, according to GM's 10 May statement, and KM signed MBM in). 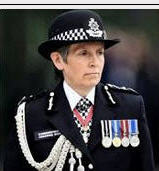 Didn't KM state that she became Kate McCann after the 3rd... prior to that, even though married, she called herself Kate Healy. So why sign the creche register as Kate McCann? It's not an official document after all, and lots of parents don't have the same surname as their child, so a childminder wouldn't think it was strange. The "substitute" child theory begs the question why... because if a sub was used on Sunday, then some sort of premeditation is suggested, is it not? No mention of the bracelets in her previous interview. A bit of local knowledge/confirmation would be useful, as we assume these are the plastic self-lock type we know from theme parks, festivals, etc which once attached would be worn with pride by most kids and stay on for the whole week, not replaced every day and certainly not every session. No evidence of bracelets in any photos of course, with at least one arm or wrist covered up or hidden in every case I believe and with the ‘tennis’ photo published in both a left and right handed version, a ready made excuse if the question of ‘where’s her bracelet’ was ever asked, as she shows her right arm and wrist in this one and her left arm and wrist in the 'last' photo, which is cut off just at the point where you could just about claim it had slid down at little bit out of picture. Why was it only the OC staff that describe Maddie as shy etc? Reply “Very, she was very lively, a very lively, happy, a happy little girl really. Because, probably a bit of, we were almost a bit worried how Ella and Madeleine would get on, because Ella’s quite shy and sensitive and Madeleine’s very, erm, I don’t know whether you can call a child vivacious, but, you know, sort of very, erm, outgoing and. But, I mean, they did, they got on and they had a whale of a time. But, yeah, very, very lively, chatty, a chatty little girl. I mean, to be honest, I know Madeleine probably less well than I know Kate and Gerry, because often, with Kate and Gerry, we saw them, it was like at fortieth birthday parties and that sort of thing. So, Madeleine herself, I wouldn’t say as, I didn’t know her as a little girl, whereas, you know, the other children, Millie and the other ones, you know, I saw very regularly”. Reply “I think just the fact she is very outgoing, you know. As I say, Ella, in her nature, is a bit more, you know, quiet and, erm, a bit more probably reserved. Well, again, I don’t know whether you’d call a child reserved, but more, you know, not quite so”. Reply “Yeah, she’s, yeah, whereas, I think Madeleine would be, she would always be in the centre, anything that was going on she would be, I don’t mean to say the ring-leader, but she would be at the centre of it, so”. 4078 “I don’t want to put words in your mouth and I don’t want to ask inappropriate questions either”. 4078 “How you described Madeleine, up to what point was she sort of the leader, if you like, was she verging on the, because some children can be downright annoying”. Reply “No, again, I think this is what I was almost wondering, whether, with Ella being sort of the stand-back type, whether, but, no, she wasn’t like that at all, she was just”. Reply “Just happy. In a nice way, yeah. No, she wasn’t, erm, she wasn’t a brat, no, I mean, that’s you could describe, she wasn’t, no, bratty or sort of, I can’t remember the word I’m trying to look for, precocious”. Reply “No, she was just very, and she was obviously, you know, they were enjoying themselves, they were running around screaming, you know, sort of chasing them round the play area, you know. That’s my main memory of Madeleine from the holiday, is in the play area, you know, we were sort of chasing them around and, you know, just being, just running around, quite happy”.